NEW YORK—Tens of thousands of athletes will weave through the five boroughs this Sunday for one of the world’s biggest annual marathons—The ING New York City Marathon. This year’s marathon is both special and somber due to recent events that impact it. Last year’s marathon was cancelled due to Superstorm Sandy’s strike on New York and New Jersey’s low-lying communities. This April, the neighboring Boston Marathon, which features the same distance as New York’s of just over 26 miles, turned to tragedy when two bombs went off at the finish line, killing three people and injuring hundreds of others. 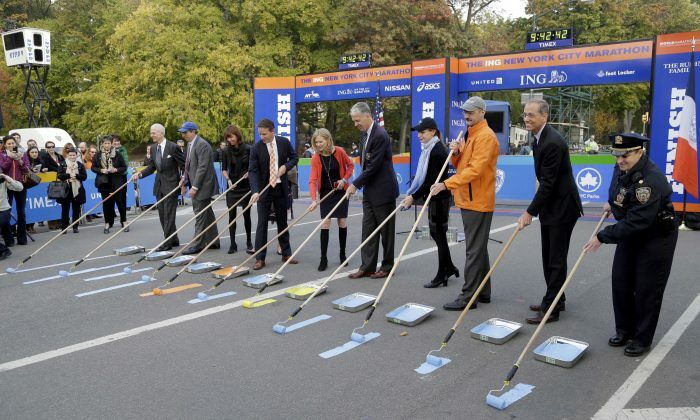 At the official line-painting ceremony Oct. 30, just three days before the official marathon, President and CEO of New York Road Runners Mary Wittenberg said this year the marathon has a deeper meaning as a yellow finish line will be added to the New York’s signature blue. A yellow line, one of the official colors of the Boston Marathon, will be painted from Columbus Circle to the finish line at 67th Street and Central Park West. “This year when our runners from around the world turn the corner to the finish at Columbus Circle, they will be greeted by a line of inspiration,” Wittenberg said. The line is meant to encourage the runners to keep going, and to preserve the “essence of marathons,” which celebrates the triumph of the human spirit, according to Wittenberg. Along with representatives from the mayor’s office, ING Groep N.V., and others, they painted the lines on the concrete in front of the finish point, which was in the form of a large gate fitted with timers on top. Road Runners has been organizing the marathon since 1970, and has been attracting the world’s top athletes and recreational runners. The Rudin family was this year’s recipient of the annual Abebe Bikila Award for their continued support of distance running. Bill Rudin, chairman of The Association for a Better New York (ABNY), spoke about the importance of marathons at the ceremony. “This city is like the marathon, when you train, you work hard, and somewhere along the line you run, you think everything is going great, and then you hit that wall at the 20-mile mark … but you don’t stop,” he said. Other than numerous blue lines, and one yellow line, there will also be an orange line to commemorate the official color of the sponsor—ING. ING has sponsored the marathon for the past 11 years. Next year the official sponsor will be India-based Tata Consultancy Services Limited (TCS), and its partnership with the city’s marathon will be for eight years. Some 48,000 people are expected to reach the finish line on Sunday. The 26.2 mile track starts at Staten Island, travels through Brooklyn into Manhattan over the Queensborough Bridge and up First Avenue into the Bronx, across to Central Park, winds through the park and finishes at 67th Street and Central Park West. The marathon will be broadcasted to 330 million viewers worldwide, not including the 2 million locals in the five boroughs who will watch from the sidelines. Although many recreational runners will be enjoying the track, some athletes run for charities. The prize given to the first male and female runners will be $100,000 each, with $15,000 each to the male and female wheelchair race winners.